(Manheim Township, PA) Nov 15, 2018 – Willow Moon Publishing, a small indie publishing company owned by Jodi Stapler of Lancaster will be releasing its eighth book on Dec 1, 2018 just in time for the holidays. Willow Moon Publishing began out of Jodi Stapler’s home in Fall 2016. As a voiceover artist, performer and entrepreneur, Jodi noticed a decline in the quality of the audiobooks that she was narrating. She knew there were talented writers who tell engaging, dynamic, and compelling stories that all too often are overlooked by the “Big Five” and who find it difficult to get their work into the hands of readers. She felt that there needed to be an indie publishing company that provided access to these quality stories. With her entrepreneurial spirit and go-getter attitude, Jodi decided to start a publishing company herself. She began by publishing plays that she and her mother had written back in the early 2000’s to perform at her children’s theatre, Imagination Children’s Theatre in New Holland. The plays had been sitting in a filing cabinet since the theatre closed in 2006. Publishing the plays was a learning curve and she does not count them in Willow Moons eight releases. However, these were turned into audiobooks and can be found on Amazon and Audible. Over the next few months, she published a few children’s books for a friend while learning even more about the publishing business and does not count these in the releases either. Once Jodi felt she had learned enough to start publishing officially she created a legal business and put out a call for book queries. Since that time, she has worked with authors from all over the US and illustrators from all over the world. Willow Moon Publishing’s eighth release, Marcy Mabel Mollie McMann, is the second in a series in the Healthy Habits Book Series, a children’s series written by Alison T Broderick of Atlanta Georgia and illustrated by Mina Anguelova of Portugal. Marcy is a rough and tumble girl who loves to get dirty, but hates to wash her hands. She learns the importance of washing those germs away when she comes down with a virus and can’t go out and play. 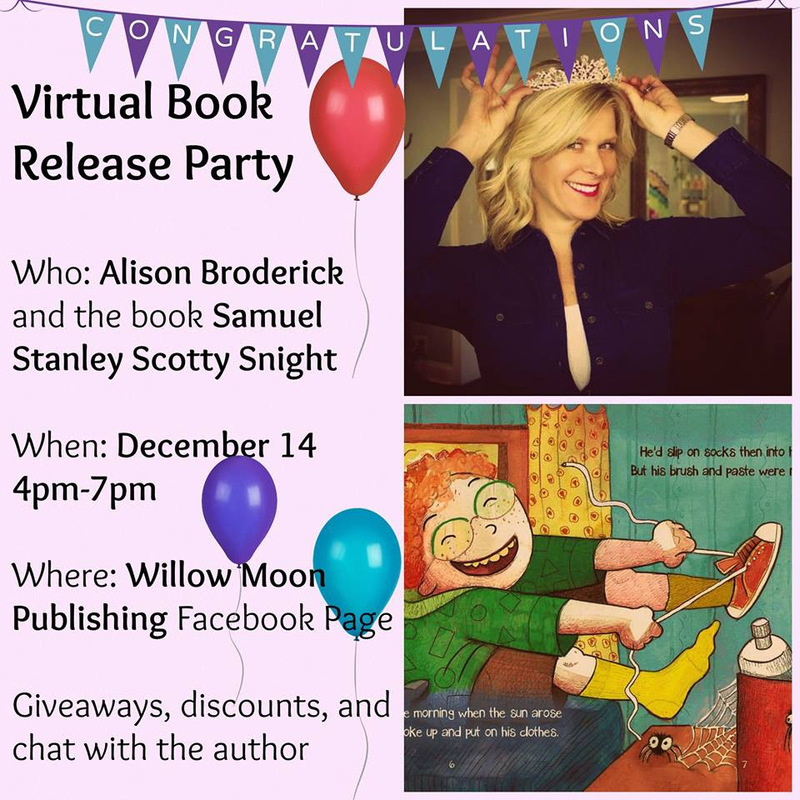 The first book in the series, Samuel Stanley Scotty Snight, was the first release from Willow Moon Publishing and follows Sammy learning the importance of brushing your teeth. Most of the books published by Willow Moon Publishing are children’s books, but not all. WMP has published a cookbook with recipes from the bakery, J’s Sweet Treats, an adult play by Paul Hood of Harrisburg and a Dance Memoir from Eveline Carle of Cape Cod. Willow Moon Publishing uses Ingram/Lightening Source and KDP for distribution and releases can be found at Amazon, Barnes and Noble and anywhere books are sold. or visit the website at https://willow-moon-publishing.com/ for more information. Marcy Mabel Mollie McMann is available in Hardcover ISBN 978-1-948256-15-5, for $19.99 and Paperback ISBN 978-1-948256-19-3 for $14.99. Jodi is also the host of Love You A Brunch Podcast, a weekly foodie podcast released on Tuesday mornings anywhere podcasts can be heard. Eveline Carle, owner of Cape Cod Dance Center in Cataumet, has written a book that is part memoir, part self-help guide. A book launch party for “Dancing Feat: A Dancer’s Journey To 14 Golden Rules of Teaching,” will be held on November 15 from 7 to 9 PM at Bucatino Restaurant in North Falmouth. The cover image from Ms. Carle’s new book, which chronicles her life in dance and her journey from Montreal to Cape Cod. Longtime dance studio owner Eveline Carle has crossed over into the discipline of writing. Her book, “Dancing Feat: A Dancer’s Journey to 14 Golden Rules of Teaching,” was recently released by Willow Moon Publishing. Ms. Carle is having a book launch party Thursday, November 15, from 7 to 9 PM at Bucatino Restaurant and Wine Bar in North Falmouth. Part memoir, part instructional, and part workbook (Ms. Carle has scattered some blank pages throughout the book for readers to write “In My Own Words”), “Dancing Feat” represents Ms. Carle’s personal story of her unusual and trying childhood, combined with her triumphs both as a dancer and as a teacher. Ms. Carle shares her story starting at the age of 7 with the accidental death of her younger brother and the subsequent breakup of her family. After some personal upheaval Ms. Carle, who grew up in Montreal, finds herself at age 14 living in an ashram in New York for the summer and teaching dance to some children at the retreat. The experience gave her some much-needed structure and confidence, which helped her when she returned to Canada. Dance becomes Ms. Carle’s escape hatch and ultimately her redemption. The 14 Golden Rules surfaced as she was writing the book. Truisms such as “Learn to Stand Straight,” “Set Goals,” and “Keep Enthusiasm Alive,” are explained using examples from the world of dance, but the messages could be applied to any discipline or life path. “[The book] really is beyond the dance world,” said Ms. Carle, “it has a spiritual element to it. “I’m hoping that it’s a journey for people when they read it. I’m very vulnerable when I tell my story and it leads to self-acceptance. Hopefully [readers] will be on the same journey while reading it. “It’s meant to inspire people to open up with love and understanding to how we’re all really meant to care for each other and to care for ourselves. I think that’s what I learned by teaching is that learning to really care for those young kids, opened my heart and I had to apply those same feelings towards myself. Ms. Carle said she hopes people will like the way the book shares something personal and then leads to ideas that might be useful to everyone. Unlike some books that take years to put together, Ms. Carle said the impetus for the book was very immediate. “I hope the book will allow people to go to their softer side,” said Ms. Carle. For the November 15 book launch, one of Ms. Carle’s first students is going to speak and Ms. Carle and others will read from the book. Wine and cheese will be available. Author Alison Broderick and Illustrator Mina Anguelova join together to create a lighthearted children’s book about the importance of dental hygiene. Alison T Broderick lives in Marietta, Georgia, with her husband, two boys (ages 14 and 12) and Golden Retriever, Duke. She began her professional career as a journalist, but her dream of writing children’s books dates back to early childhood. Samuel Stanley Scotty Snight is her debut book. Connect with Alison on Facebook at http://www.facebook.com/AlisonTBro derickAuthor. Deadtime stories is a collection of short stories, published posthumously by the author Katherine Viers, ranging from surreal to sci-fi and from fantastic back to the intensely personal and moving. Written over the span of a decade, Viers gives the reader a gripping connection to her believable characters, pulling us in with the raw and vulnerable humanity of their lives. She uses a revolutionary pared down technique with dialogue that amps up the intensity of the tales. Deadtime stories is a collection of short stories, published posthumously by the author Katherine Viers, ranging from surreal to sci-fi and from fantastic back to the intensely personal and moving. Written over the span of a decade, Viers gives the reader a gripping connection to her believable characters, pulling us in with the raw and vulnerable humanity of their lives. She uses a revolutionary posted down technique with dialogue that amps up the intensity of the tales. Willow Moon Publishing, an independent small publisher, owned by Jennie Wiley, Cape Cod and Jodi Stapler, Lancaster, Pa, has published Deadtime Stories: A Collection of Short Stories by Kathryn Viers. Kathy who passed away at the age of 64 of Lung Cancer in 2014, grew up on Strasburg’s Grasshopper Level and was a 1967 graduate of Pequea Valley High School. She spent most of her young adult life as a fulltime mother to three daughters and was known as “mom” to all of the neighborhood children. A local Girl Scout leader, softball coach, and community theatre actress, in her spare time she was a painter and writer. Although she was never published professionally before her death, her stories and plays were enjoyed by many in Lancaster County, Pennsylvania and Nashville, Tennessee. Deadtime Stories is a collection of short stories ranging from surreal to sci-fi and from fantastic back to the intensely personal and moving. Written over the span of a decade, Viers gives the reader a gripping connection to her believable characters, pulling us in with the raw and vulnerable humanity of their lives. She uses a revolutionary pared down technique with dialogue that amps up the intensity of the tales. Deadtime Stories: A Collection of Short Stories is a 138-page paperback with a retail price of $11.00. The ISBN is 978-1-948256-04-9. It was published by Willow Moon Publishing, Lancaster, Pennsylvania. For more information, or to request a review copy, please go to our virtual pressroom at https://willowmoonpub.com .